A heart rate monitor has become standard equipment for any cardiovascular exercise. This is especially true for older people or those that have not exercised regularly. Basic units use a sensor/ transmitter that is built into a strap, worn around the chest, that sends a signal to a receiver that is usually worn like a watch. The up-side of this type is that they measure the heartbeat continuously and are usually the most accurate. A more popular option is the strapless monitors. These do not read the heartbeat continuosly but are activated by placing two fingers on the two sensors of the receiver. A basic monitor that gives your normal heart rate with alarms at the high and low ends of your target range, and maybe calories burned, is usually adequate for most people. Heartrate monitors require some set-up to input basic information like your age and weight. 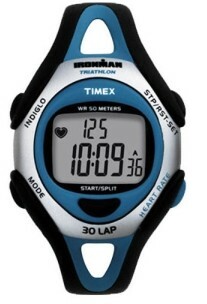 They will monitor your ideal heartrate training range and set alarms that will beep if you exceed the set limits. The target range for training is about 60% to 80% of your maximum rate. A rule of thumb for obtaining the maximum heartrate is 200 minus your age. For example if your age is 60 your maximun training heartbeat should be 140 bpm. Your training range would be a minimum of 84 bpm (beats per minute) to a maximum of 140 bpm. There are much more high-tech monitors especially designed for cycling that will show altitudes, temperatures, speeds, and just about anything that you could possibly care about but these are primarily intended for competitive athletes and are considerably more costly than a basic unit. Before beginning any training program make sure you consult a medical proffessional.